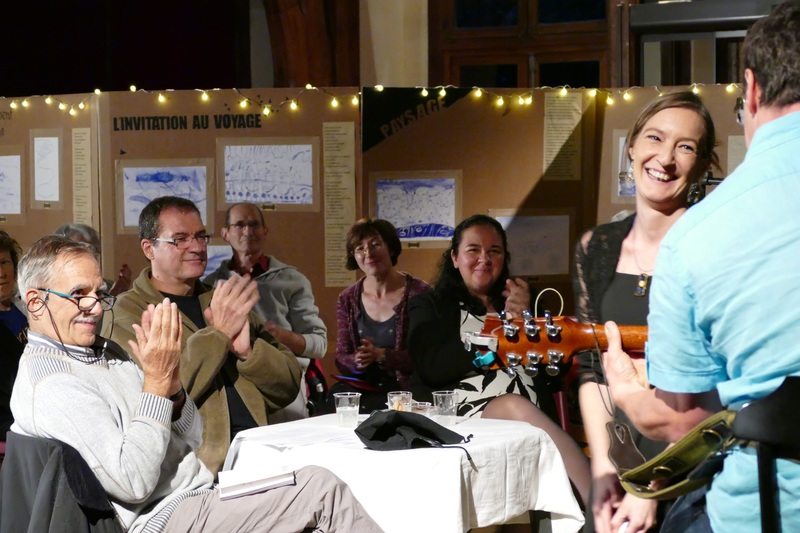 By Dr Caroline Potter, Baudelaire Song Project consultant, reports on an important Baudelaire festival which took place in the Pyrenees in summer 2017. Is Charles Baudelaire’s poetry relevant to audiences and arts practitioners in 2017? 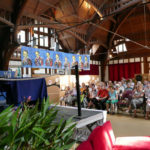 The annual song festival in the French Pyrenees, Rencontres lyriques de Luchon, showed the answer is a resounding ‘yes’. In the year marking the 150th anniversary of Baudelaire’s death, the poète maudit was the festival’s theme and the indefatigable organisers, led by soprano, voice teacher and conductor Sylvia Cazeneuve, wove Baudelaire into events focused on music, art, film and food as well as literature. Cazeneuve and her regular collaborator, pianist Caroline Oliveros, started the festival with a wide-ranging recital of Baudelaire settings including several rarities. The songs were cleverly interspersed with a semi-staged narrative of Baudelaire’s life, delivered with aplomb and humour by Cazeneuve herself. They included the premiere of Lionel Ginoux’s Trois mélodies lourdes, settings by the Marseille-based composer of three of the six poems that were censored from the first edition of Les Fleurs du Mal. Ginoux has a particular affinity with the voice, and in conversation later in the week over Fleurs du Mal-themed tea and cake, he said he prefers to set poetry without cutting the text. His direct, communicative songs were warmly received by a mostly local audience. Many of the audience were involved in Baudelaire-related projects which were presented at the festival, including an exhibition of art by residents of retirement homes and people who are supported by community inclusion projects (Baudelaire would surely have identified with these people at the margins of society who engaged with his work). The art formed a backdrop to my talk on Baudelaire’s relationship with music and his importance to composers working in diverse musical genres; it was touching that many of the artists attended the talk and other events. 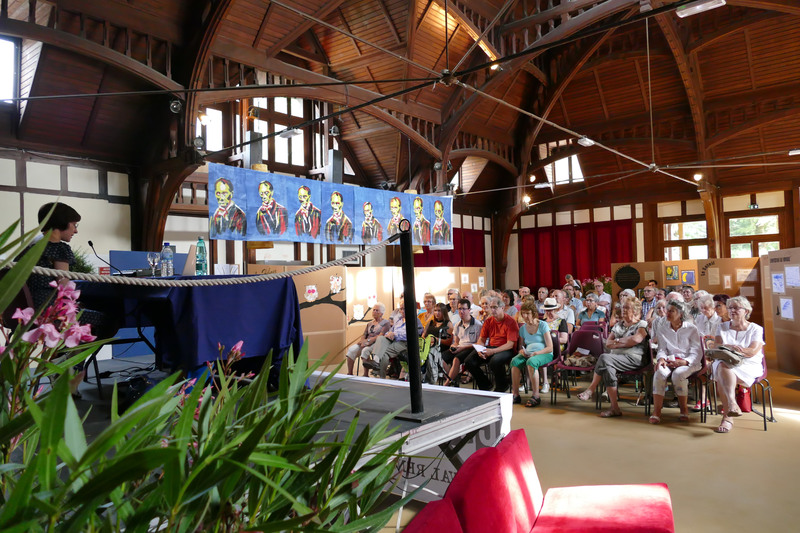 Four local choirs, including the punchy, beret-and-red-sash-wearing Fils de Luchon, presented a concert in Luchon’s parish church loosely linked by readings of Baudelaire. I especially enjoyed an imaginative immersive presentation of poetry by the community groups involved in the art project. Here, Sébastien Oliveros’ lighting, Christelle Vinsonneau’s staging and François Fok Chow Tho’s sound and instrument design contributed to staged and multimedia performances including a percussion-accompanied Baudelaire reading in the local Gascon dialect. Poetry readings, film screenings and masterclasses for vocal students completed a packed week of Baudelaire events. 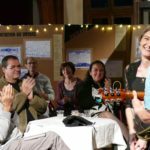 This was an enriching, vibrant and often touching week that brought Baudelaire to the people of Luchon and enabled them to take ownership of his poetry.